BACKGROUND AND PURPOSE: Middle cerebral artery (MCA) aneurysms often have an unfavorable aneurysm geometry that might limit endovascular therapy. Our purpose was to analyze the feasibility, safety, and efficacy of coil embolization in a consecutive series of MCA aneurysms chosen for endovascular treatment. PATIENTS AND TECHNIQUES: Of 235 MCA aneurysms seen at our institution during the past 5 years, 36 patients harboring 38 MCA aneurysms were primarily selected for coil embolization: 18 patients had an acute subarachnoid hemorrhage (SAH), 16 of which were due to a ruptured MCA aneurysm. SAH was classified according to Hunt and Hess grade: I (5), II (7), III (5), IV (0), and V (1). RESULTS: Complete occlusion could be achieved in 33 of 38 aneurysms. In 5 aneurysms, coil embolization was not performed because of an unfavorable aneurysm geometry with a wide neck or incorporation of adjacent branches (3) or failed because of insecure coil placement (1) or severe vasospasm (1). Procedural complications included coil protrusion into the parent artery (1), and thromboembolic M2 occlusion (5), with recanalization in 4 of 5 cases. Of 8 aneurysms with initial subtotal occlusion, 3 progressed to total occlusion during follow-up. Three aneurysms had to be retreated, and no patient rebled. Glasgow Outcome Scale at 6 months for the patients with SAH (17/18) was good recovery (12), moderate disability (4), severe disability (0), persistent vegetative state (0), and death (1); outcomes for patients with an incidental aneurysm (17/18) were good recovery (16) and moderate disability (1). CONCLUSION: Endovascular coil embolization can be performed safely and effectively in selected MCA aneurysms. Initial subtotal aneurysm occlusion might progress to total occlusion. Endovascular therapy of intracranial aneurysms is rapidly undergoing major developments. With increasing experience and development of appropriate devices the indications for endovascular aneurysm therapy have considerably widened. Initially restricted to the surgically “difficult” or inoperable lesions, predominantly in the posterior circulation, endovascular aneurysm therapy is now challenging surgical clipping as a genuine alternative therapy. Moreover, various meta-analyses comparing the risks of endovascular and surgical treatment for unruptured aneurysms have demonstrated significantly reduced morbidity and mortality for the endovascular approach.1 The recently published results of the International Subarachnoid Aneurysm Trial study—the first randomized, multicenter trial comparing the safety and efficacy of endovascular coiling with standard neurosurgical clipping for intracranial aneurysms judged to be suitable for both treatments—demonstrated a significantly better outcome after endovascular coiling.2,3 As a consequence, in April 2002 the Data Monitoring Committee recommended a premature halt to recruitment for the trial. Because precise indications for choosing surgical or endovascular repair of MCA aneurysms are lacking, and in our institution the primary treatment recommendation for aneurysms is endovascular embolization, we retrospectively reviewed a consecutive series of ruptured and unruptured MCA aneurysms chosen for coil embolization to analyze feasibility, safety, and efficacy of endovascular treatment. During the past 5 years, 183 patients harboring 235 MCA aneurysms presented at our institution. Of these patients, 130 had subarachnoidal hemorrhages (SAHs), 62 of whom had an additional intracerebral hematoma. The bleeding source was a ruptured MCA aneurysm in 112 patients and a ruptured aneurysm in a different location in 18 patients, respectively. In our institution, patient selection for either surgical or endovascular therapy is always done individually for each patient in an interdisciplinary approach jointly by an experienced vascular neurosurgeon and an interventional neuroradiologist. Decision criteria include location, configuration, and size of the aneurysm, presence of an intracerebral hematoma or vasospasm, patient age, other medical conditions, and patient demands. Most of our MCA aneurysms (157) were thus treated surgically by clipping, mainly because of the presence of a space-occupying hemorrhage or an unfavorable aneurysm geometry with a broad aneurysm base and/or incorporation of adjacent branches into the aneurysm base. Of 235 MCA aneurysms seen at our institution over the past 5 years, 45 (19%) were selected for treatment with endovascular techniques. Selection criteria used to distinguish those aneurysms suitable for coil embolization were a dome-to-neck ratio ≥2:1, a neck diameter not exceeding 5 mm, and no incorporation of adjacent branches into the aneurysm base in the diagnostic angiogram and, if available, CT angiography. By using these criteria, we identified a consecutive series of 36 patients (26 women and 10 men; mean age, 51.1 years) with 38 aneurysms of the MCA primarily selected for endovascular therapy (Tables 1 and 2). At admission, patients presenting with an acute SAH (18) were clinically assessed according to the Hunt and Hess (HH) scale: grade I in 5 (27.8%) patients, II in 7 (38.9%) patients, III in 5 (27.8%) patients, IV in no (0%) patients, and V in a single (5.6%) patient. Sixteen patients had an acutely ruptured MCA aneurysm, 14 of whom were treated by endovascular coiling. Two patients had a ruptured aneurysm in a different location: a single case each of internal carotid artery (ICA) and anterior cerebral artery (ACA), treated by clipping and coiling, respectively. Twenty-four MCA aneurysms considered for endovascular therapy were unruptured. Eighteen patients (50%) had 22 incidentally discovered MCA aneurysms. Six of these patients had symptoms unrelated to the aneurysm (3 patients with migraine headache, 2 patients with a transient hemiparesis, and a single patient with dizziness); 11 patients were asymptomatic. In one patient who had a basilar thrombosis, with complete recanalization after intra-arterial thrombolysis, the MCA aneurysm was an incidental finding. Of the 38 aneurysms treated by coil embolization, 17 (44.7%) were located at the MCA bifurcation, 17 (44.7%) at the segment M1, and 4 (10.5%) at the M2 segment. Aneurysm size ranged from 3 to 18 mm. It was <6 mm in 24 (63.2%) aneurysms, 6 to 10 mm in 7 (18.4%), and >10 mm in 7 (18.4%) aneurysms. The 36 patients considered for endovascular therapy harbored 64 aneurysms altogether, 45 of which were MCA aneurysms; 38 of these 45 MCA aneurysms (14 ruptured and 24 unruptured) were considered for endovascular therapy. Seven aneurysms of the MCA were treated by clipping. Nineteen patients (52.8%) had multiple aneurysms (total of 47; 28 at the MCA). Eight patients (22.2%) presented with bilateral (mirror) MCA bifurcation aneurysms. Tables 1 and 2 illustrate patient characteristics, clinical data, aneurysm size and location, occlusion rates, and outcome. Treatment was performed as soon as possible after admission. All patients with a suddenly ruptured aneurysm were treated within 3 days after primary SAH, except one (22; Table 1) with SAH that occurred 10 days before treatment. In 18 patients with SAH, the bleeding source was immediately treated by coiling in 15 patients (14 MCA and 1 ACA) and by clipping in 3 patients (2 MCA and 1 ICA). Simultaneous endovascular treatment of 2 (9 cases) and 3 (a single case) aneurysms was performed in 10 patients for 21 aneurysms. General anesthesia was administered to all patients, and a femoral approach was used in all cases. A Tracker Excel-14 microcatheter and a Transcend EX 14-guidewire (Boston Scientific, Natick, Mass/Target Therapeutics, Fremont, Calif) was generally used to catheterize the aneurysm selectively. The microcatheter was placed coaxially through a 6F guide catheter (FasGuide; Target Therapeutics or Envoy; Cordis Neurovascular, Miami Lakes, Fla). Aneurysms were embolized with a detachable coil system (GDC; Boston Scientific/Target; EDC; Dendron-MTI, Bochum, Germany) with a coil diameter of 0.010 in (GDC-10s, EDC-10s) or 0.018 in (GDC-18s, EDC-18s). We did not use balloon neck protection or stent-assisted coiling for any of the cases presented. For the unruptured aneurysms, systemic heparin sodium was administered as an intravenous bolus of 50 IU/kg of body weight after placement of the sheath and then continuously infused to maintain an activated clotting time (ACT) of at least 2 times the normal level (250–300 seconds) throughout the procedure. In addition, 500 mg of aspirin was administered intravenously regularly in unruptured aneurysms. In the acutely ruptured aneurysms we do not usually administer heparin before placement of the first coil. After the procedure, all patients were transferred to the neurosurgical intensive care unit for at least 1 day. Effective intravenous administration of systemic heparin was continued for all patients as long as 48 hours to prevent clotting, allowing approximately twice the normal value. Aspirin (100 mg/day, orally) was given for 3 months. At the time of treatment, 6 patients had severe vasospasms. In 4 cases, intra-arterial papaverine (300 mg) was infused via the microcatheter to allow selective catheterization of the aneurysm. Coil embolization was possible in 2 patients in the same session. In 1 patient, endovascular treatment was possible after 4 days of pretreatment with nimodipine. Evaluation of efficacy determining the extent of aneurysm occlusion was done immediately after treatment and at follow-up angiography by a neuroradiologist experienced in endovascular aneurysm therapy. Occlusion rate was divided into total (100%) and subtotal (95%–99%), both considered complete and incomplete (<95%) occlusion of the aneurysm. Clinical outcome was ascertained according the Glasgow Outcome Scale (GOS). In our institution, baseline MR imaging, including MR angiography (MRA) and diffusion-weighted imaging, is routinely performed in all patients treated endovascularly for cerebral aneurysms within 3 days after treatment. In every patient follow-up digital subtraction angiography (DSA), MRA, and clinical examination (GOS) was scheduled 6 months after treatment. A further follow-up imaging was scheduled 18 months after treatment, performed with MRA only, if MRA and DSA at 6-month follow-up were concordant. Endovascular coil embolization was feasible in 31 of 36 patients with 33 aneurysms. 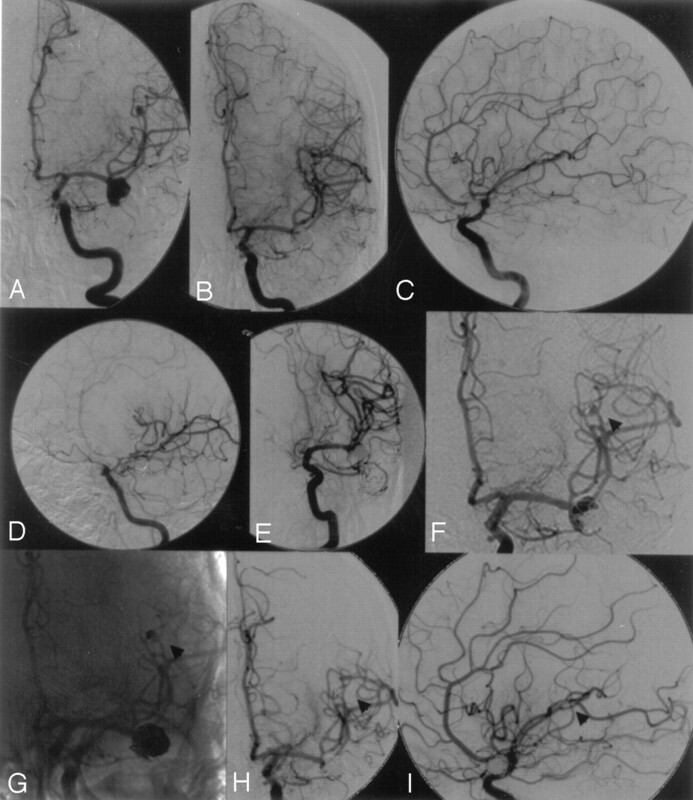 In 5 of 36 patients coil embolization of the aneurysm was attempted but was not performed because of an unfavorable aneurysm geometry with a wide neck (2) or incorporation of adjacent M2 branches into the aneurysm base (1) (demonstrated by rotational subtracted angiography or selective aneurysmography) or failed (2) because of an insecure coil placement (1) or severe vasospasm (1) despite pretreatment with papaverine. In the patients with an unfavorable anatomy and insecure coil placement, either the neck was too wide (2) or the segment M2 was incorporated in the aneurysm base (2). Thus, coiling was not performed, and these patients were referred for surgical clipping. Complete aneurysm occlusion was achieved in 33 of 38 aneurysms (complete occlusion rate of 86.8%). Of the completely occluded aneurysms, 25 (75.8%) were totally (100%) occluded, and 8 (24.2%) were subtotally (95%–99%) occluded. Six-month angiographic follow-up was available for 25 of 36 patients. Eleven patients did not have control angiogram at 6 months because 5 patients were clipped, 3 refused further examination, 2 were not available, and 1 patient with initially incompletely occluded aneurysm died of bronchopneumonia 7 weeks after treatment. Evaluation of occlusion rate was done immediately after intervention and re-evaluated in 27 MCA aneurysms (25 patients) at least 6 months after embolization. Of the initial 25 totally occluded aneurysms, 16 remained totally occluded. Of the 8 aneurysms with subtotal occlusion, 3 progressed to total occlusion, 2 remained subtotally occluded, and follow-up was not available for 3. Two patients (22 and 30; Table 1) had recanalization of 3 aneurysms due to coil compaction. Both were retreated, one (22) by recoiling for 2 MCA aneurysms (Fig 1); in the other patient, rotational angiography revealed a second, initially missed, small aneurysm at the MCA bifurcation. Clipping was considered superior for both (the partially recanalized and the newly detected) aneurysms. At follow-up, 3 patients with an initial total occlusion (9, 10, and 13; Table 1) had a very slight contrast opacification at the aneurysm base without evidence for coil compaction or significant recanalization. Aneurysms were still considered completely occluded, retreatment was not considered necessary, and the patients were scheduled for further follow-up. 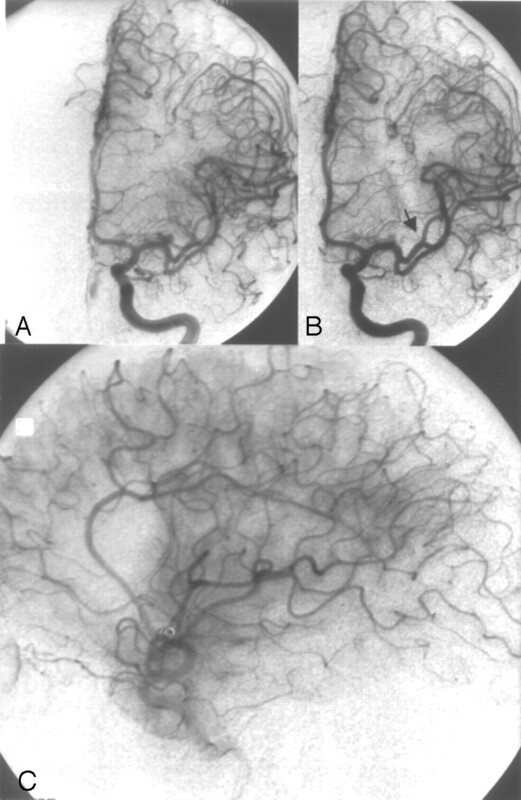 A, Left internal carotid artery (ICA) angiogram showing a left middle cerebral artery (MCA) bifurcation aneurysm and an additional distal MCA aneurysm. B and C, Left ICA angiogram after complete embolization of both MCA aneurysms. D, Left ICA angiogram 4 days after coil embolization demonstrating severe vasospasms at the distal ICA and proximal MCA. E, After successful balloon dilation of the ICA and proximal MCA by using a 3-mm balloon occlusion system. F and G, Six-month follow-up showing partial recanalization of both aneurysms as a result of coil compaction (arrowhead at distal MCA aneurysm). H and I, Left ICA angiogram after retreatment showing complete occlusion of both MCA aneurysms (arrowhead at distal MCA aneurysm). Procedural complications included thromboembolic occlusion of a neighboring MCA branch (segment M2) in 5 patients, including 1 patient with protrusion of a coil loop bulging into the parent artery (segment M2). Selective intra-arterial thrombolysis was performed in all 5 patients by using urokinase (500,000, 1 million [Mio] IU) and resulted in recanalization in 4 of 5 cases. One of the 4 recanalized patients, in whom 500,000 IU urokinase did not recanalize the artery, additionally received a bolus dose (0.25 mg/kg over 3 minutes) of abciximab (ReoPro) intravenously followed by an additional 7.5 mg of abciximab as a 12-hour infusion, leading to complete recanalization. Three of the 5 patients had no neurologic deficits, 2 patients had neurologic deficits (MD) 30 days after EVT because of MCA infarction persisting in 1 patient (24; Table 1) and fully recovered in the other (15; Table 1 and Fig 2). A, Left internal carotid artery (ICA) angiogram showing a 3-mm left middle cerebral artery (MCA) bifurcation aneurysm. B, Left ICA angiogram after complete aneurysm occlusion with 2 coils (GDC-10: 3 × 6, 2 × 4). Note the occlusion of the small neighboring arterial branch M2 (arrowhead). C, Left ICA angiogram, lateral view, late arterial phase after selective intra-arterial thrombolysis (1 Mio IU urokinase) still showing a small perfusion deficit. The MCA was partially filled in a retrograde manner through cortical vessels, thus avoiding larger infarction. Outcome according GOS at 6 months was GR. In 1 patient, a small nonocclusive thrombus formation was observed at the coil-parent artery interface. Abciximab (0.25 mg/kg) was administered intravenously and then infused (10 μg/min). Serial angiograms showed complete resolution of the thrombus within 15 minutes after administration of abciximab. No distal emboli were observed. The patient had no neurologic deficit. No other complications were observed during endovascular therapy. In particular we had no aneurysmal rupture. Four patients showed ischemic lesions in the postinterventional diffusion-weighted MR imaging and were clinically symptomatic 30 days after EVT. At 6-month follow-up, 2 patients remained clinically symptomatic (9 and 24; Table 1), 1 patient recovered with no neurologic sequelae (22; Table 1), and 1 patient was not available for follow-up (16; Table 1). No rehemorrhage occurred in any patient with a ruptured MCA aneurysm between admission and endovascular therapy. At the time of treatment, 6 patients had severe vasospasms. Chemical angioplasty with intra-arterial administration of 300 mg of papaverine chlorhydrate was performed in 4 patients, resulting in successful subsequent embolization of the aneuryms in 3 patients. GOSs at 30 days were good recovery (GR; 2) and severe disability (SD; 1); after 6 months the third patient improved to moderate disability (MD). One patient (23; Table 1, HH 2) developed severe vasospasm 5 days after endovascular treatment, resulting in SD according to GOS after 30 days. The patient died of bronchopneumonia 7 weeks after endovascular treatment. Four days after embolization of 2 MCA aneurysms, 1 patient (22; Table 1) presented with severe hemiparesis and aphasia due to severe vasospasm unresponsive to aggressive medical treatment. Selective balloon dilation of the ICA and proximal MCA was performed under general anesthesia by using a 3-mm balloon occlusion system (Equinox; MTI, Irvine, Calif) (Fig 1). The patient recovered without clinical sequelae. At 6 months, GOS scores for 17 of 18 patients with acute SAH were GR (12), MD (4), SD (0), persistent vegetative state (0), and death (1). GOS scores 6 months after endovascular treatment for 17 of 18 patients with an unruptured aneurysm were GR (16) and MD (1). The 5 patients in whom endovascular therapy was not performed or failed were clipped with total aneurysm occlusion in 4 and subtotal in one patient. Clinical outcomes were GR (4) and MD (1). No patient rebled. This 46-year-old woman (15; Table 1) had an asymptomatic 3-mm left MCA bifurcation aneurysm that was completely occluded with 2 platinum coils (GDC-10: 3/6, 2 × 4). At the end of the procedure, occlusion of the neighboring arterial branch (M2) occurred. Selective intra-arterial thrombolysis was performed immediately by using urokinase (1 Mio IU), but only partial recanalization could be achieved (Fig 2). The MCA was partially filled in a retrograde manner through cortical vessels, thus avoiding larger infarction. The outcome at 6 months was GR. A 31-year-old man (19; Table 1) with an incidentally discovered 4-mm aneurysm at the right MCA bifurcation was embolized with 3 platinum coils (GDC-10: 4 × 10, 3 × 8, 2 × 4). Control angiography at the end of the procedure still demonstrated a slight opacification of the medial aneurysm rim, classified as subtotal occlusion. A follow-up angiogram 6 months after embolization revealed subsequent thrombosis of the aneurysm with total (100%) obliteration (Fig 3). A, Right internal carotid artery (ICA) angiogram, oblique view, showing a 4-mm aneurysm at the right middle cerebral artery (MCA) bifurcation. B, Right ICA angiogram, oblique view, after embolization with 3 platinum coils (GDC-10: 4 × 10, 3 × 8, 2 × 4) still demonstrating a slight opacification of the medial aneurysm rim, classified as subtotal occlusion. C, Follow-up angiogram 6 months after embolization revealed subsequent thrombosis with total (100%) aneurysm occlusion. This 43-year-old woman (31; Table 1) had a history of migraine headache. MR imaging revealed bilateral asymptomatic MCA bifurcation aneurysms and a third aneurysm distal at the cerebellar superior artery. In the first procedure, the left MCA and the cerebellar superior artery aneurysms were completely embolized. 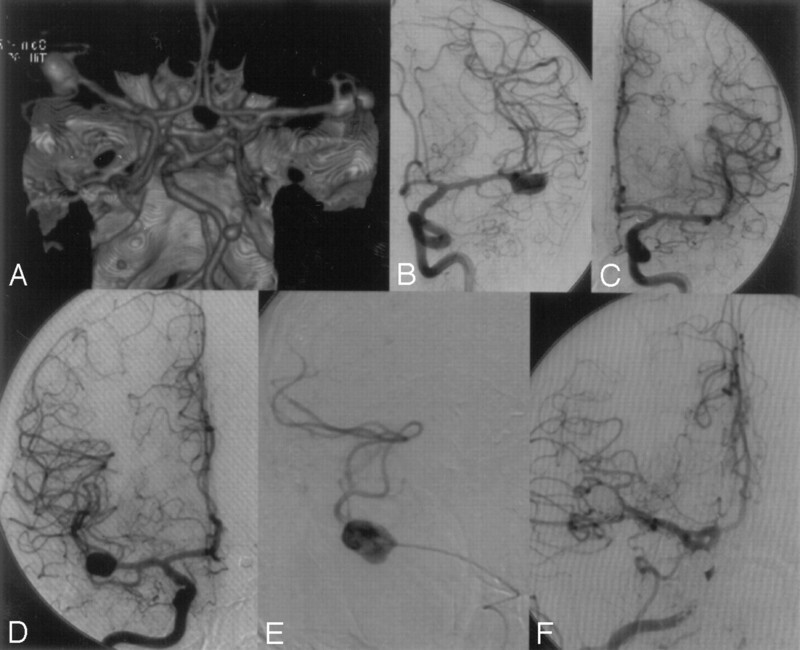 Eight weeks later, the right MCA aneurysm was occluded with coils (Fig 4). The patient is doing well clinically, without any deficits. A, CT angiography revealing bilateral asymptomatic middle cerebral artery (MCA) bifurcation aneurysms and an additional aneurysm at the left distal superior cerebellar artery. B and C, In a first procedure, the left MCA and the cerebellar superior artery aneurysms were completely embolized. D–F, Eight weeks later, the right MCA bifurcation aneurysm was completely occluded with coils. Aneurysms arising from the MCA account for 18%–22% of aneurysms and are the third-most-common site of aneurysmal hemorrhage.7–9 Patients with MCA aneurysms are more likely to have additional aneurysms than patients with aneurysms in other locations.10,11 MCA aneurysms are often wide-necked and/or incorporate the origin of arterial branches in the aneurysm base. Thus, in many institutions, the primary treatment technique for this location is surgical clipping. Anticoagulation management is of great importance in this setting. Because most procedure-related complications are of a thromboembolic nature, periprocedural anticoagulation therapy is of great importance.13,19 In the absence of contraindications, we use intravenous heparin therapy in all patients undergoing endovascular aneurysm treatment. In unruptured aneurysms, we also administer aspirin intravenously. In acutely ruptured aneurysms, however, we usually do not administer heparin before placement of the first coil. Evaluation of occlusion rate was done immediately after embolization and re-evaluated in 27 MCA aneurysms (81.8%) after 6 months. In this circumstance, we have to object that the data of our series do not reflect long-term results; however, 6-month follow-up demonstrated total aneurysm occlusion in 19 (70.4%), subtotal occlusion in 7 (25.9%), and incomplete occlusion in one (3.7%) of the controlled MCA aneurysms. Recanalization occurred in 2 patients with 3 aneurysms. In 3 patients, we observed a very slight opacification of the base without any evidence for coil compaction or significant recanalization. For these patients, we decided not to retreat the aneurysm but to perform further follow-up in another 6 months. Endovascular coil embolization of MCA aneurysms is effective and can be performed with acceptable mortality and morbidity in selected patients. Anticoagulation and complication management is of great importance in this setting. Our results demonstrate that an initial subtotal aneurysm occlusion might progress to total occlusion during follow-up. Long-term follow-up review is necessary to further define the overall role of endovascular treatment in the management of MCA aneurysms. ↵* Both authors contributed equally to this paper. Presented at the 42nd annual meeting of the American Society of Neuroradiology, Seattle, June 5–11, 2004. Accepted after revision August 14, 2005.